Another Fur Futures success story comes from Spanish designer Javier Echeverría Sola. When Javier was offered the opportunity to become an International Fur Federation (IFF) Fur Futures Member he was initially humbled for the recognition IFF showed him. However, with the bursary he received from IFF, this recognition quickly translated into several new opportunities. Javier was able to take part in IFF’s Remix Fur Design Competition where he was selected as finalist in Spain with Occidens and his capsule collection. Not long after this, Javier was able to attend Mr Vasilis Kardasis Fur Design Workshop at Centria University in Finland. Expanding his skills and discovering new techniques made Javier’s trip a life-changing experience. In Javier’s words, this course was the “greatest opportunity” afforded to him, and it was only made possible with IFF’s Fur Futures bursary fund. Below is Javier’s blog entry on his experience at Centria and how the financial backing from IFF, which supported his passion for fur fashion design, made him realise that he can achieve anything with determination and hard work. The amazing and enriching experience I lived at Centria is hard to put into words, but I will do my best to express how important it has been for me. What started as an unlikely possibility, attending a design course at Centria University in Finland – the only university in the world offering a degree in Fur Design & Business, became a feasible way of shaping my future and my business degree into fur and fashion. And this was all thanks to IFF. With IFF’s Fur Futures bursary I was able to attend Mr Vasilis Kardasis workshop at Centria during the months I lived in Finland as a business exchange student. From the beginning, the course at Centria was amazing. I was able to meet the one and only Vasilis Kardasis again, who is not only one of the best teachers I have ever had because he is able to teach by asking you questions and making you reflect on philosophical, social and historical issues. But, his teaching methods force you to reconsider your own way of working and even your own dreams. One of the first things Vasilis said to us was: “forget what you have learned”, and instantly any and all of the existing boundaries surrounding creativity we had were broken. This became the first rule for a project in which we had to create a garment. Following this rule was a challenge which centred two main premises: first, we had to create a garment in pairs with one member in charge of the top part of the garment and the other in charge of the bottom. Secondly, the garments construction should be exempt from any curves unless they were part of the surface treatment of the “fabric” created. These two premises helped us discover new ways of working. In my case, this meant working with patternmaking in a very different way, one which can only be explained as some kind of “hard cardboard moulage” – a modification of the traditional moulage technique. This new approach to technique allowed for the creation of new patterns, but more importantly, it allowed for the development of sculptural shapes which resembled diamond-cutting techniques, which are a huge innovation within the fur industry. Javier Sola’s Centria University fur fashion collection. Besides the actual course, this opportunity has opened many doors for me. The most important and exciting one being: The Snow Queen Musical. Thanks to the colour choice and the evolution of the design, my garment, which was initially meant to remain as a piece of exhibit at Centria Campus Allegro, will actually be the main costume for The Snow Queen. I will be in charge of the design and manufacture of the musical’s costumes, most of which will include fur according to each characters role. This serves as proof of the feasibility of including fur in every aspect of costume design. In addition to The Snow Queen Musical costume designs and a possible exhibit in Moscow, this course has helped me tremendously with my International Degree in Management studies. My final thesis, which will be presented next year, will be titled: “The Fur Industry & Fur Trade. Then & Now”, a topic which I am now extremely knowledgeable on thanks to this course. Additionally, thanks to my time at Centria University I have made many contacts from different sectors within the fur industry. industry experts such us, Pia Blomström, Vasilis Kardasis, Fur Finland and Saga Furs, all of which I will interview for my thesis. To sum up, an incredible and enriching opportunity that once seemed impossible, thanks to Fur Futures was feasible. 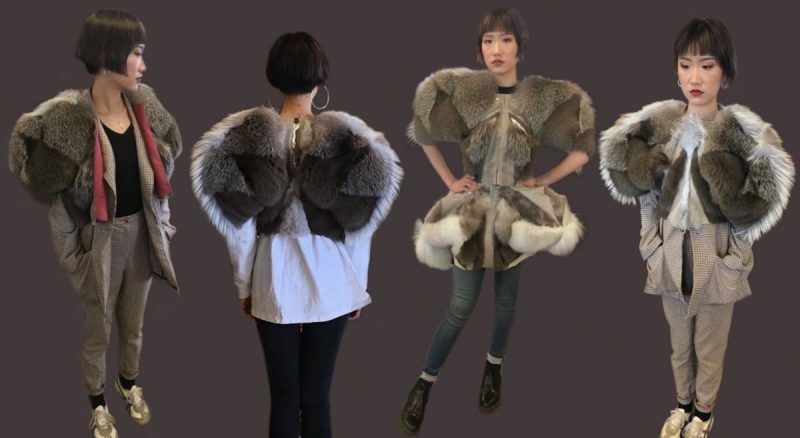 This Intensive Fur Design Workshop has helped me to shape my career into fur and fashion, and this has made a dramatic change in my current and future prospects.